She is a MacGregor 26S Fractional Sloop cruiser. Designed to be the largest trailerable live-aboard cruiser, she is 26 ft. long and 8 ft. wide. Any larger requires special permits, etc., to be able to trailer across state highways. 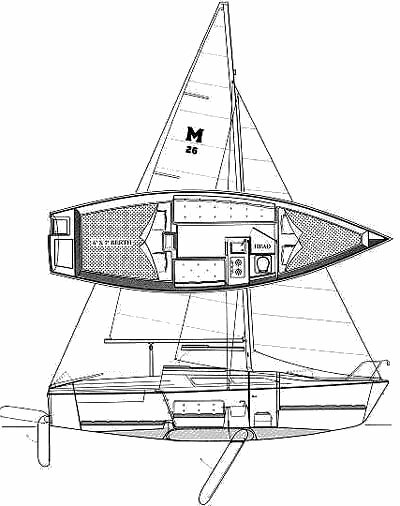 She has a 5 ft. weighted swing keel which may be fully retracted into the hull, plus a fully retractable rudder which gives her the ability to be sailed in as little as 18 inches of water or to be sailed right up on a beach, a feat not possible with a typical sailboat. Using 1200 lbs. of jettisonable water ballast, she weighs only 1800 lbs. on the trailer making her easy and economical to trailer anywhere in the US. She is designed to be a very comfortable self-contained live-aboard cruiser with a queen-sized bed aft and a somewhat smaller bed in the forward v-berth. She has a galley (kitchen), a head (bathroom), fresh water supply, and 12v / 110v electricity. She has a unique cabin which stretches from gunnel to gunnel creating a much larger interior. She also has a pop-top which raises to give you 6' of interior height while moored or in light seas. Safety was a prime concern as I was looking for the perfect trailerable live-aboard cruiser. The MacGregor has safety features not available on any other sailboat I have found. The unique design of the water ballast tanks will automatically right the boat if knocked down by a sudden powerful blast of wind or perhaps a rogue wave. She will also stay afloat even if the entire cabin and the cockpit are completely full of water. I know all that sounds like a 'Titanic' story, however, I have seen the manufactures videos where they demonstrated this by flooding the entire boat - and she still floats. They also demonstrate the MacGregor being sailed in gale force winds (60 + mph) with 18ft. seas. While I hope to never see either of those up close and in person, it's comforting to know she can handle them. Another comforting fact is that there has never been a reported catastrophic failure of an un-modified MacGregor sailboat. This ship is built well... Oh, one other thing - even though she is a live-aboard cruiser she sports a US Racing handicap average of 220. Pretty quick for a cruiser! I bought her late spring of 2012. I had just completed 3 weeks of sailing training at a local yacht club. The day after classes were done, we trailered her up to Door County, Wisconsin. I learned to sail our new sailboat well that week. Following our vacation, she has been slipped at the EastPort Marina in Peoria. She's just 10 minutes from work and I sail her as often as I can in the evenings and on weekends. I created this website to be able to share our adventures with you. While there is not much at the moment, I have a lot of plans for the future. This past summer, we were sailing on the largest lake in the world - Lake Superior. 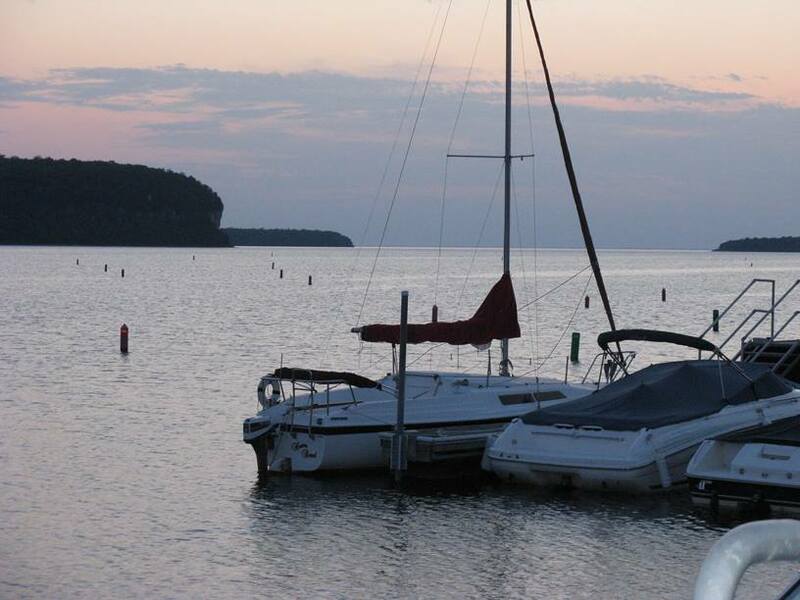 We cruised the Apostle Islands, a group of 21 islands in the southwestern section of the lake. These islands are considered among the best cruising areas in the country. Click on the Apostle Islands link above for pictures of the trip. We are currently planning a trip in 2015 along the eastern shoreline of Lake Michigan. We will update the website when we return! Check back now and then as we get more sailing time under our belts... I would love to have you join me, either here or on board! Click on the links above and enjoy!